The Key went through two overhauls during its life. 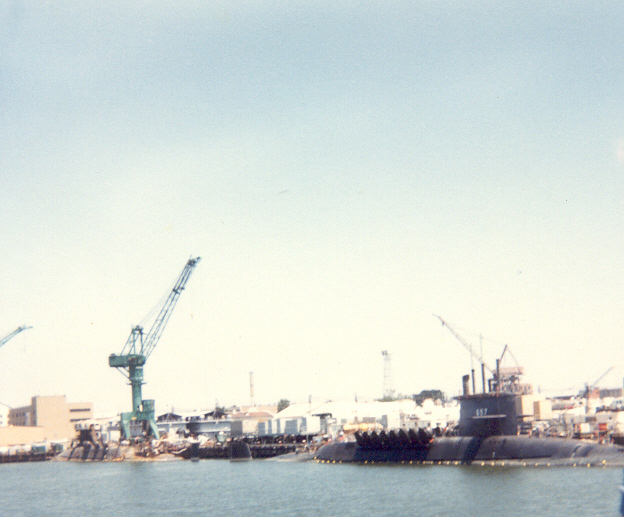 Each was a unique experience as it was the only time the blue and gold crews were merged into one crew for the duration of the overhaul. In these pages we would like to remember those days in pictures and words. I was part of the crew for overhaul #1 in Bremerton, WA. from 1972 - 1973. Overhaul # 2 was from early 1983 to mid 1985. Anyone with pictures or stories from the overhaul periods is welcome to contribute so that we can recreate as complete a history as possible. The Key had three completely different missile systems installed at various times during its life. It started with Polaris, then Poseidon, then Trident. 1972 - Bremerton, Washington. Click on Sea Stories to read about the trip to Bremerton. We almost did not make it. Other material coming soon - still gathering material. Shipmate Jeff Buss has contributed many pictures, forms and text for this overhaul period in Newport News, VA. Click on the above link to go to the pages for that overhaul.